Imagine letting someone choose a tattoo for you that you can’t see until it’s inked on you for life. 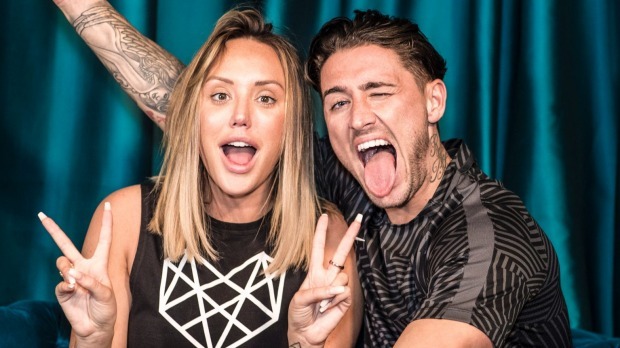 That’s the premise of the new MTV show, Just Tattoo of Us, starring Charlotte Crosby and Stephen Bear. The British reality stars’ relationship turned from professional to personal when they fell in love on set. CHARLOTTE: We started working together because we are both MTV talent (Charlotte was on Geordie Shore and both have appeared on Celebrity Big Brother) and we got chosen to be host Just Tattoo of Us together. I wasn’t really looking forward to it because I thought he was associated with someone I didn’t really get on well with, but he wasn’t so it all worked out fine. My first impression of him was that he was very outgoing and very talkative. He has a crazy character and he is very unique in the fact that you would never meet anyone like him. People really warm to him and are fascinated by him because he is just so different and wild. You just can’t take your eyes off of him, he is very entertaining. However his biggest weakness is sometimes he doesn’t think about what he is saying. On the show I am kind of the one who feels sorry for the people, gives them a hug and tries to make them feel better whereas Bear is the one who tries to make it worse. We are both pretty open and honest and we don’t really have a filter but I have more of a sensitive side and I can sense emotions more than I think Bear can. Bear is larger than life, always cracking jokes although they may not always be good ones. If we are not at work we will get up, Bear’s dad will make us bacon and egg sandwiches and we will sit in the living room with his brother Mad Rob. We might take the dog out for a walk but most often we talk about what takeaway we are going to order and what film we are going to watch. We all take about two hours deciding on the film, no decision is made then we put anything on. It is usually crap so we decide to change and then I moan about being tired but Bear yells at us every time I try to go to sleep. His most annoying habit is that he always has to do a nighttime routine though. So I am in bed saying c’mon let’s have a cuddle he’ll spend at least 30 minutes cleansing the face, wetting the hair, brushing it back with the tangle teezer, brushing the teeth, flossing, getting the retainer in… it takes him a while. His quirkiest habit is that he likes to paint his nails. He is just a bit OCD with his nighttime routine. I’ll always remember when we were on holiday in the Caribbean and he bought me a ring and he came around the pool and presented it in a box. I literally couldn’t speak. No words could come out because I was so taken aback, I couldn’t believe he had done such a nice thing. STEPHEN: I had no worries about working with Charlotte because I just get on with everyone. Even if I don’t like you, I’ll pretend to get on with you. Plus Charlotte’s a nice bit of eye-candy to look at while we are working. However my first impression of Charlotte was that she was moody. Goodness me she was so arrogant, she was so rude. I can’t explain it, I don’t know if it was a defence mechanism or she thought she was being cool. I would try and talk to her and she would walk away and shake her wiggly bum at me. But now it’s wicked working with Charlotte, I would love to do more with her because it feels like I am not even working. She is the best looking girl in existence, it is like the gods have created her to a tee, she is perfection. Charlotte’s biggest strength is probably putting up with me, I could send her mad so she is doing a really good job. She is also very spontaneous, she will just say let’s go do this and we do, I think that is a very good quality of Charlotte’s. I do like to wind people up a bit to cause a bit of tension in the show when it is needed and Charlotte is good at calming it down. Also she is better at presenting, she is very good and very professional whereas I am a bit more raw. Sometimes I can’t remember any lines and she will tell me what I need to say. Typical day we go downstairs and dad does make a bacon sandwich with a bit of egg and a bit of ketchup. Charlotte has a coffee without milk because she is lactose intolerant. I have a bit of milk even though I say I am never having milk again, it makes me bloated too. We usually do always end up watching a film at home though. I always put it on and as soon as I do Charlotte will go on her phone and there is no point really putting it on then. She will blame me for picking a bad film, even though she had the opportunity to pick on out herself. Her biggest weakness is going on her phone too much, it drives me insane. She will go on her phone and I will say, no babe don’t do that. I think I want attention all the time from her but she just wants to switch off sometimes since we are always together. Sometimes it causes an argument so I have learnt to say, just go on your phone babe. Her worst habit is that she speaks for me sometimes. I’m not stupid, I have a voice but she can’t wait to jump in and say, what he meant was this. She hasn’t got a lot of bad habits but that one is just annoying. One of her best moments was on my birthday, I knew she liked me but I didn’t think she liked me that much. I went to my hotel room and her and her mates had filled the entire room with balloons for me and she got me a nice bag I had been wanting. I was going to buy it myself but I thought, no I won’t spend that much on me so I bought her something instead. But she knew I wanted this certain bag and I thought that was really nice. The best way to describe Charlotte is she has a funny accent, she is Geordie, she is always laughing and joking and has the best legs I’ve ever seen. Just Tattoo Of Us screens on Tuesdays at 9.30pm on MTV (Sky channel 015). Next Post:The Bachelor Recap: should she stay or should she go now?